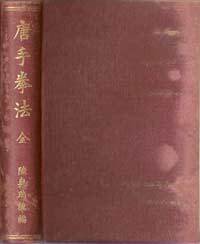 Mutsu's "Karate (Toudi) Karate" published in Japan in August 1933 by Tokyo Imperial University Karate Research Society. It was one of the first books on karate ever published. 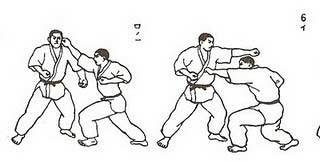 Karate Ni Sente Nashi is a very famous Okinawan saying, “There is no first strike in Karate”. It is considered by many as a central philosophical principle of karate, a topic much discussed in karate books, articles and in discussion groups. On this topic I think I’ve hit on something interesting in the 1933 book “Karate Kenpo” by Mutsu Mizuho. The last half of this incredible book describes Kumite or the use of karate technique. Mutsu organized the technique studies by type, not kata, and I’ve just realized he started with a practical method of using Karate Ni Sente Nashi. (Please refer to footnote 1). My analysis is solely based on visual inspection of the drawings, with the help of Joe-san Swift’s brief explanations. It might not be what Mutsu intended but I think it has great value. Mutsu had been a student of Funakoshi Ginchin and Karate Ni Sente Nashi must have been an important concept of Funakoshi Sensei. What I’m now realizing was the order Mutsu described how to use Karate technique is a practical method of training based on the concept. Here are the technique practices described by Mutsu. Reactive Defense, or the art of not being there when attacked using 5 training principles. a. Defender steps back with the right foot, away from the punch. b. Defender steps back with the left foot, away from the kick. a. Defender leans slightly back moving the head just beyond the punch. b. Defender skips slightly back moving the body just beyond the kick. a. Defender steps forward with the left, slipping inside the strike and striking upward into the attacker’s chest with a reverse punch. b. (Alternate) Defender steps left foot forward slipping the attackers punch to the outside. Preemptive Striking building upon the principles of Reactive Defense or the art of Counter Strikingagainst the attack. Rotation of the body and though the attacker begins their strike the lunge gets the defender there first. 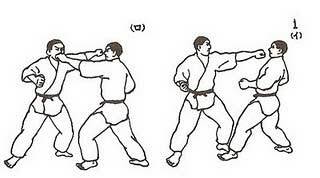 The reason I feel these technique studies are an example of Karate Ni Sente Nashi is that the first example in each series represents evasion without further response, the option of just evading the attack. Karate was not developed and taught on Okinawa because of a day to day possibility of threatening adversaries, Okinawa was a rather quiet place. There are situations where one is attacked, say at a party where the opponent is worse for wear that do not require destroying the attacker. The moral use of karate is to always be able to respond appropriately. It behooves us to incorporate those skills, evasion with no response, into our training to give each student the option of doing more than just breaking that attack. Logically I believe this is what Okinawa intended with Karate Ni Sente Nashi. I hope this introduction study to Mutsu Mizuho’s “Karate Kempo” builds your own appetite for the day this is available in English. I’ve only described the beginning of a technique usage study of great depth and variety. Much more existed than just strike and kick in his 1933 analysis of karate usage. If anything Mutsu’s efforts show how the logical analysis of karate technique potential may help develop the highest understanding of our arts. This study is not just related to Mutsu’s Itosu-Funakoshi lineage. It describes the potential of all Okinawan Karate-ka, even with their technique differences. Goju Ryu, Isshin Ryu, Shorin Ryu, Tou’on Ryu, Uechi-Ryu and more all can draw study from his efforts. I find a special affinity as an Isshinryu stylist because this study directly shows applications to the first four techniques studied by every Isshin ryu karate-ka. Acknowledgement: The friendship and sharing of Charles Joe-san Swift has been instrumental in my developing the appreciation of Mutsu’s “Karate Kempo”. Thanks Joe-san!